At 2.6 miles long, this waterfront cycling path is one of Tampa’s signature developments, connecting some of downtown’s main attractions while offering stunning views of Tampa. Tour the path by day and hop into museums and galleries. At night, the Tampa Riverwalk transforms into a light spectacle featuring illuminated arches and bridges. Along the Riverwalk, the historical monument trail represents iconic figures from the city’s history. See statutes of Florida’s indigenous people at Cotanchobee Park, for example, or the Curtis Hixon Park monument to Henry B. Plant, a railroad tycoon who first opened the Tampa Bay Hotel (now the University of Tampa and Henry B. Plant Museum). At the very north end of the Tampa Riverwalk, cyclists will find Waterworks Park featuring a splash pad, dog park, and stage pavilion. From there, visit the Ulele Restaurant for fine dining and native-inspired food and spirits. A stone’s throw away, explore innovative eateries and retail in the mixed-use community destination that is Armature Works, housed in the historic former streetcar warehouse. The fourth largest performing arts institution in the country, enjoy a year-round program of live entertainment at the David A. Straz Jr. Center. Make a stop at the outdoor SteamHeat Cafe with an ever-changing menu of light fare such as panini and desserts as well as a full menu of coffee beverages. From ancient marvels to modern curiosities, the Tampa Museum of Art features a growing collection of visual art and inspiration. 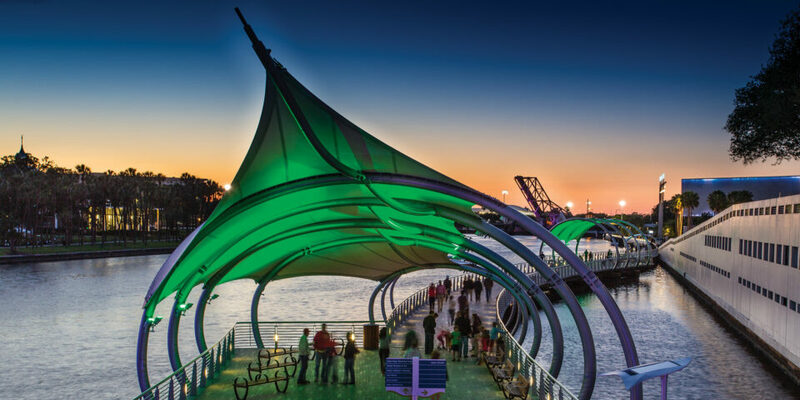 Drink in views of the Hillsborough River from Curtis Hixon Waterfront Park, which attracts over one million people annually to its special events. Relax on the Great Lawn, run through two interactive fountains: the Louver fountain and the Mist fountain, and enjoy a diverse program of entertainment. Bordering Curtis Hixon Waterfront Park, visit the eclectic galleries at FMoPA, which collects, preserves, and exhibits historic and contemporary works by nationally and internationally known photographic artists. From the infamous pirate Jack Rackham, to the hard-charging Teddy Roosevelt, three floors of exhibits explore stories from Florida’s past. Experience interactive exhibits covering Spanish conquistadors, Ybor’s ‘cigar-city’ roots, railroad tycoons, and more at the Tampa Bay History Center. Heroes Plaza honors veterans, local police, firefighters, first responders, and all other emergency personnel who have lost their lives in the line of duty. A 360-degree open-air bar and restaurant that offers waterfront views, The Sail often features live music, sports-themed happy hour specials, trivia nights, food truck rallies, and other fun events. Open 11am-2am daily, it’s the perfect spot to end your Tampa Riverwalk Tour, while grabbing a bite and a cold brew.